I have meant to write each of the past two nights, but y'all, my yard. I can't even get out of it because spring has sprung and the sun, it has been a'shining. Tulips turn their heads to the bright sky every morning and open their arms wide to receive the light and warmth. The phlox perks up and stands at attention, the poor hydrangeas dare to bud for the third time since spring started hinting at its coming, and the hostas start their cheerfully aggressive takeover of valued garden space. The chosen ones aren't the only things bursting from torpor to life. The weeds and I have been engaged in a full scale battle for a week now- hairy bittercress, clover, the one I never can identify but which sprouts with wild and initially pleasing abandon. I am quite certain that my neighbors must think me obsessive at best, for there I am again, crouched in a yogic squat and tossing uprooted weeds into Oliver's orange plastic sand pail with glee. As always, I commune with the worms and roly polys, welcome the birds into the spray from my hose, attempt to save neighborhood bunnies from Nutmeg's innate predatory instincts, and lose all sense of time and other responsibilities. Yesterday was National Grilled Cheese Day, and I took a break from gardening to speak to MacKenzie Smith, sandwich expert for About.com and founder of the blog, Grilled Cheese Social. Sara Lee had asked her to concoct some special sandwiches for the day, and I wanted to ask about her favorite cheese combos that Tom and I may not have yet tried as well as to seek advice about convincing my boys that a good grilled cheese sandwich is hard to beat. So far, they are not fans, and to be honest, I cannot understand. MacKenzie's three Bs for a winning sandwich include, of course, butter, but also base (a good, thick bread that can withstand heat and melting cheese; she likes Sara Lee Artesano, and I like brioche) and blend (the best grilled cheeses benefit from a blend of cheeses with varying melt points, salt contents, and flavor profiles). I know what I'll be having for lunch tomorrow, thank you! For lunch today, my dear friend, C, took me to the Iron Gate to get my birthday ball rolling. 41 happens Sunday, y'all. It was a beautiful day, and we sat in the courtyard, shaded in a perfectly mottled way by a large canopy of established wisteria. Despite a ludicrous drive downtown which culminated in me climbing a ladder OUT of a parking garage WHILE in heeled sandals and then skirting a delivery truck in the drive pad to exit, it was a perfect, lovely, relaxed date. Heading into the Iron Gate which is mysterious and charming and I want to go back because the interior spaces are even more inviting than the front. The menu is gorgeous and intensely seasonal. 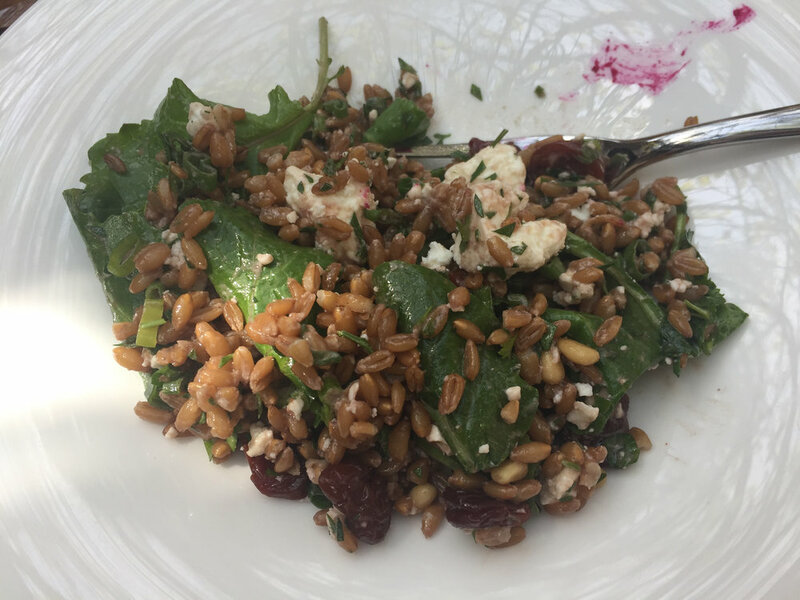 Though I had a hard time choosing, we ultimately shared two dishes -the spring pea bruschetta (OMG) and the beet, black walnut, dill, and yogurt salad- before branching into the gemelli with chiles and swiss chard pesto (C) and the farro, dried cherries, feta, pine nut, and red wine vinaigrette salad for moi. 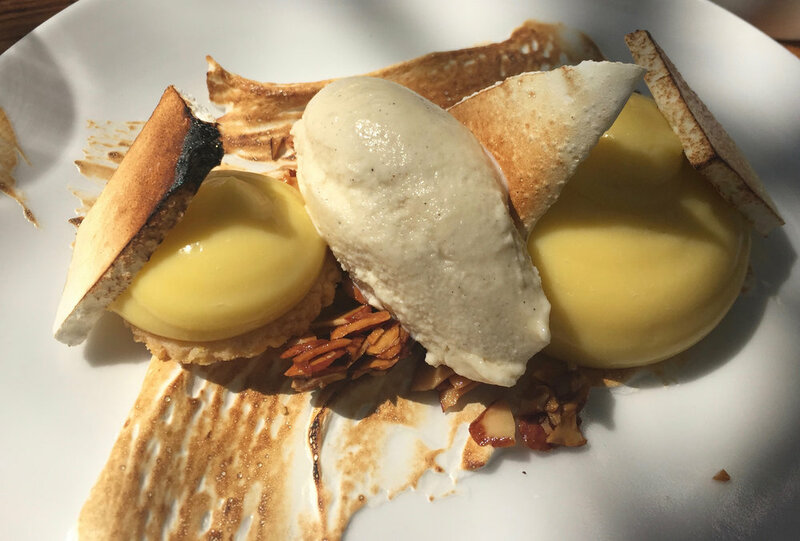 For dessert, lemon curd with meringue two ways, candied almonds, and cardamom ice cream. Perfection!